Is the Summit just for main practitioners? 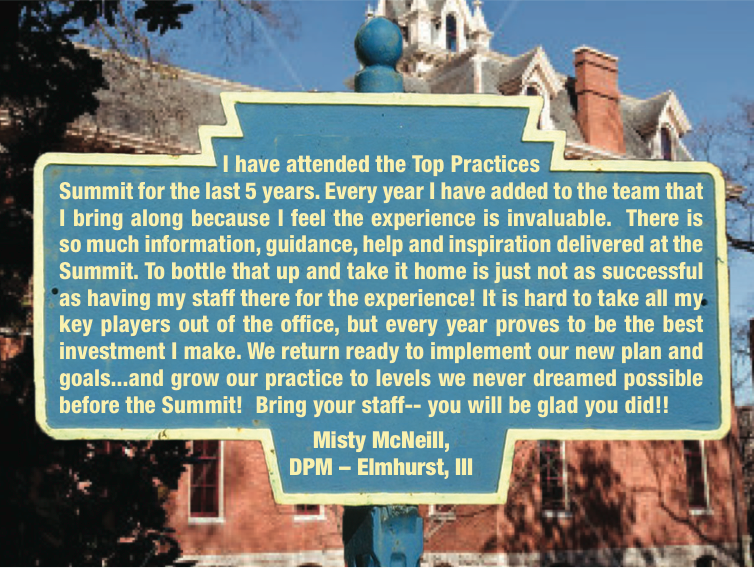 One of the many great things about the Top Practices Summit is that it’s a conference for everyone. Bringing your staff with you is guaranteed to make the next year much easier. You can’t do transform your practice by yourself and you need your team to work with you on this. Doctors who bring their key staff members with them to the Summit always experience the most gain afterward, because their staff already understands the plan, has bought into the plan, and knows their part in making the plan a reality. It is virtually impossible to bring back the attitude, knowledge, and motivation that are gained at the Summit and transfer it to your staff on your own. When you rkey people experience a conference filled with high performing peers, they are able to return to your practice and move forward quickly. Seriously consider bringing your key staff members to get the most out of this experience and to implement your plan for double-digit growth.